2: Take a screen capture of the Status Meter. 3: Disconnect the LAN cable from the modem. 4: Note the date and time of the disconnect; it is best when doing step two to also capture the time displayed on your screen. 5: Leave the LAN cable disconnected from the modem for several hours, HughesNet recommends doing this overnight, or during the day while at work. 6: Reconnect the LAN cable to the modem. 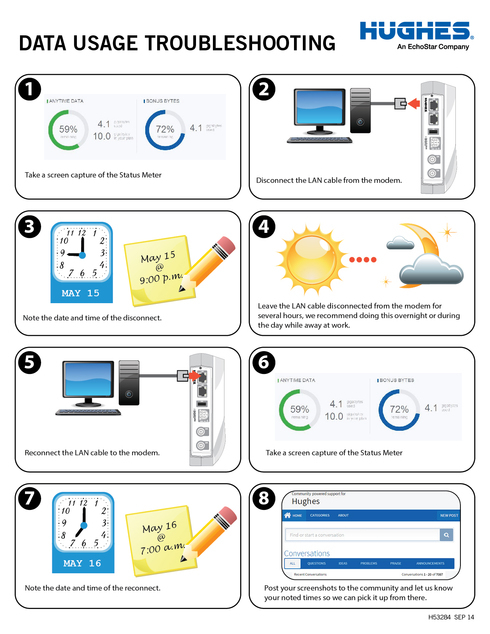 7: Take a screen capture of the Status Meter with the clock displayed on your computer. 8: Post your screens hots to the community. If you don't know how to disable the WiFi in the HT2000W, please see "How do I manage my built in WiFi modem?" in this PDF. Please be sure to click "Save Settings" after unchaining "SSID Enable" for each of the four tabs individually (2.4Ghz, then 2.4Ghz Guest, then 5Ghz, then 5Ghz Guest). See "How do I manage my built-in WiFi modem in <a href="http://customer.kb.hughesnet.com/Documents/1041318-0001_a.pdf">this PDF</a>. Does anyone know how to link in HTML? I need it to be like below, where "this PDF" is linked to the page, but I don't know how to do a link like that for the macro, and to have it show up like below when I add the macro to a page. If you don't know how to disable the WiFi in the HT2000W, please see "How do I manage my built in WiFi modem?" in this PDF. Please be sure to click "Save Settings" after unchecking "SSID Enable" for each of the four tabs individually (2.4Ghz, then 2.4Ghz Guest, then 5Ghz, then 5Ghz Guest). If you don't know how to disable the WiFi in the HT2000W, please see "How do I manage my built-in WiFi modem in this PDF. Please be sure to click "Save Settings" after unchaining "SSID Enable" for each of the four tabs individually (2.4Ghz, then 2.4Ghz Guest, then 5Ghz, then 5Ghz Guest). AWESOME!!!!! I've got to fix the question mark and the closing quote, but it worked!!!! That's an awesome pic, and you're welcome! You're an HTML wiz now.